Accept a new taxonomy for theory, normative theory, descriptive theory to reintroduce normative propositions (such as those of ethics or methodology) to the scientific mosaic. The modification was suggested to Scientonomy community by Zoe Sebastien on 3 September 2016.1 This modification presupposes the acceptance of Sciento-2016-0001. The discussion was closed on 23 January 2017 and the modification was not accepted. It was superseded by Sciento-2017-0001 and Sciento-2017-0002. Currently, a theory is defined as a set of propositions that attempts to describe something. This definition excludes normative propositions from the scope of the TSC. Normative theories, such as those of methodology or ethics, have been excluded since including them appears to give rise to a destructive paradox first identified by Joel Burkholder. There are many historical cases where employed scientific methods are known to conflict with professed methodologies. This seems to violate the third and zeroth laws of scientific change. By the third law, employed methods are deducible from accepted theories. But, this seems impossible in cases where methodologies and methods conflict. Under the zeroth law, all elements in the scientific are compatible with one another. But, that seems to be clearly not the case if methodologies and methods conflict with one another. 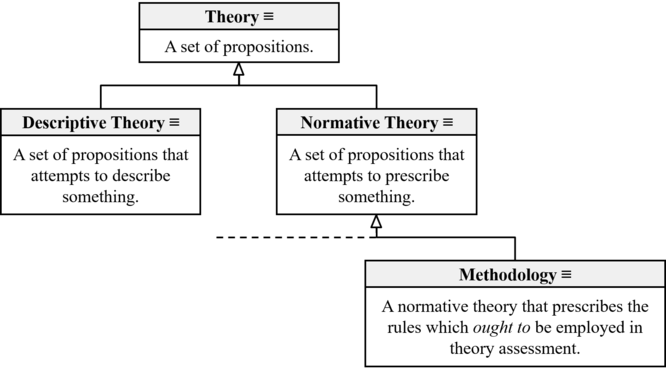 Define theory as "a set of propositions" and include normative and descriptive propositions as subcategories of theories with methodology as a subcategory of normative theory. Consequently, modify the definition of theory acceptance to make it possible for both descriptive and normative theories to be accepted. Theory (Sebastien-2016): A set of propositions. Descriptive Theory (Sebastien-2016): A set of propositions that attempts to describe something. Normative Theory (Sebastien-2016): A set of propositions that attempts to prescribe something. Theory (Barseghyan-2015): A set of propositions that attempt to describe something. Methodology (Barseghyan-2015): A set of explicitly formulated rules of theory assessment. The discussion was closed on 23 January 2017 and the modification was not accepted. Since this modification consisted of two interrelated but essentially distinct suggestions - one definitional and one ontological - it was decided by the community to divide it into two modifications so that the gist of the proposed suggestions is properly articulated. In particular, it was agreed that there are two modifications in "the heart of this single modification - one ontological, the other definitional".c1 It was also agreed that the current formulation "is exclusively definitional, and does not give the community an opportunity to appreciate (and, well, accept) the ontological changes that come along with it".c2 Consequently, it was decided to divide this modification into two modifications - one definitional and one ontological.c3 This modification was superseded by Sciento-2017-0001 and Sciento-2017-0002. Click on the Discussion tab for comments. This page was last modified on 25 April 2018, at 23:44.